Traditional food in the Hubei region, also said to be representative of the food culture of Shiga prefecture. There is a habit of fermentation smell, but it is delicious, it is the best dish as a drink liquor. Misu sushi made of rice and salt (鮓). 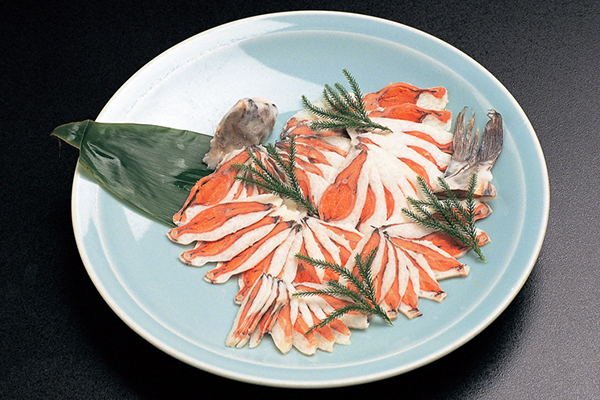 Nigorobuna of Lake Biwa is said to be the best, and among them the Hina Sushi of the child is popular. It is rich in lactic acid bacteria as a fermented food, eaten as a nourishing tonic and health food in the people's life for a long time, was once immersed in many families. The recipe for dipping salt-cut Nigorobuna in rice and salt is common, but the taste and fermentation state also change depending on the preservation method and pickling method, and it does not become the same taste no matter who pickles it. As the fermentation progresses, it gets somewhat sour, but people who like it and how to enjoy it, like drinking it, are people. Even though I got misunderstood that I got rotten when I bought it as a souvenir, the episode that I was thrown away is also fermented odor as much as it is, but when I like it it tastes like a taste, it is excellent with Nagahama's sake. You can purchase it at "Road Station" in Nagahama City or at a souvenir shop.